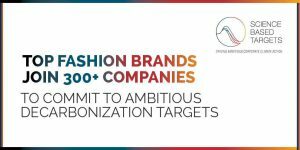 Six apparel majors – including Gap, Inc. and NIKE, Inc. – kicked off Climate Week by joining the Science-Based Targets initiative. Ahead of this announcement, Quantis was commissioned by ClimateWorks to conduct a footprint assessment of the apparel sector as whole. To that end, the World Apparel and Footwear Database provided a sound basis for the sector to address an estimated 5% share in global GHG emissions, a footprint comparable to that of Russia. Quantis backs companies in their commitments to cut carbon emissions throughout their entire value chains. Get inspired – learn all about Science-Based Targets requirements and their benefits for your business. You can get started with our webinar on how to create science-based goals where Mars and Intel share perspective on the ground. What next? Brush up on the specifics with our “Supercharging Sustainability Metrics with Science” article.